"European Union boss Jean-Claude Juncker issued a jaw-dropping threat to the United States, saying he could campaign to break up the country in revenge for Donald Trump's supportive comments about Brexit," the UK's Daily Express reported Friday. "In an extraordinary speech the EU Commission president said he would push for Ohio and Texas to split from the rest of America if the Republican president does not change his tune and become more supportive of the EU." Good boy, Siegfried. Here's your Scooby Snack. 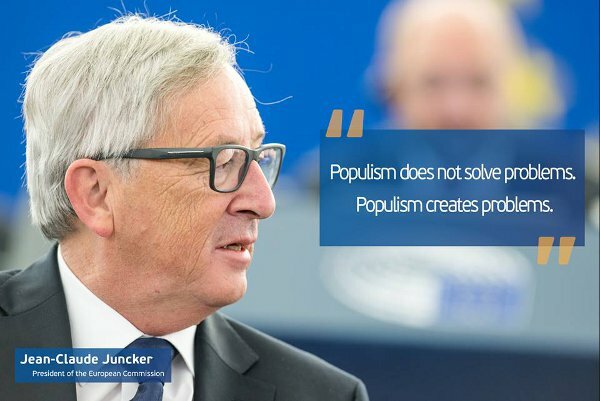 That such arrogance reflects imperious rejection of the right to self-determination for Europeans, and that Constitutionalists in the U.S. may not welcome foreign globalist subversion, are hardly considerations that sway the type of mentality that believes his place is to dictate and yours is to obey. Either that or the old Eurorummy is drunk again. This isn't the first time we've seen this Juncker character express contemptuous disdain for individual choice and freedom. This is the character whose lickspittles characterize those opposing his determination to rule them from afar as "extremists," a tactic we see "profiteers of hate" like the SPLC routinely use here to smear people of principle. "We have fought hard for an ambitious deal that reduces the risk of shootings in schools, summer camps or terrorist attacks with legally held firearms. Of course we would have liked to go further, but I am confident that the current agreement represents a milestone in gun control in the EU."